Description: Description: For April's meeting we will all read Autobiography of a Yogi by Paramahansa Yogananda. Whether you read this long ago and want to dip into it again, or have always meant to read it, now is your opportunity to gather with us and discuss this spiritual classic. Paramhansa Yogananda (often misspelled 'Paramahansa' Yogananda) was born on January 5, 1893 in Gorakhpur, India. He was the first yoga master of India to permanently live and teach in the West. Yogananda arrived in America in 1920, and traveled throughout the United States on what he called his 'spiritual campaigns'. His enthusiastic audiences filled the largest halls in America. Hundreds of thousands came to see the yogi from India. At some packed venues thousands were turned away nightly. A national sensation, Yogananda's lectures and books were extensively written about by the major media of the era, including Time Magazine, Newsweek, and Life. He was even invited to the White House by President Calvin Coolidge. Yogananda continued to lecture and write up to his passing in 1952.Yogananda's initial impact was truly impressive. But his lasting impact has been even greater. Yogananda's "Autobiography of a Yogi", first published in 1946, helped launch a spiritual revolution throughout the world. His message was nonsectarian and universal. Yogananda's Guru, Swami Sri Yukteswar, sent him to the West with the admonition, "The West is high in material attainments, but lacking in spiritual understanding. It is God's will that you play a role in teaching mankind the value of balancing the material with an inner, spiritual life." Paramahansa Yogananda is currently considered a "single author." If one or more works are by a distinct, homonymous authors, go ahead and split the author. 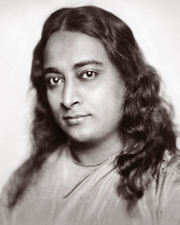 Paramahansa Yogananda is composed of 23 names. You can examine and separate out names.